This chapter discusses the implementation and first results of a gerontorheumatology outpatient service (GOS), the facility of which was set up to meet the growing healthcare demands of the elderly with musculoskeletal problems in the Netherlands. 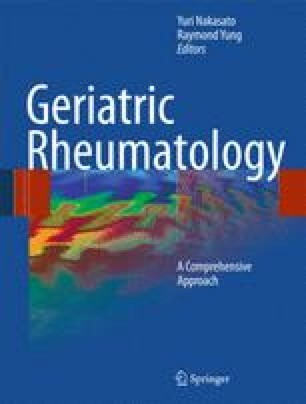 The GOS translates the principles of geriatric rheumatology for clinical practice. After a short introduction, the rationale for and activities of the GOS are described in some detail to inform healthcare providers about this tailored approach in geriatric care. The main inclusion criteria, the goals of the intervention, the procedures and follow-up actions are outlined as well as the outcomes of a first tentative patient and referrer survey. Because the service primarily focuses on functional abilities, the instruments used to assess functioning are described in relation to the International Classification of Functioning, Disability and Health (ICF). The chapter concludes with recommendations for future developments in geriatric rheumatology.